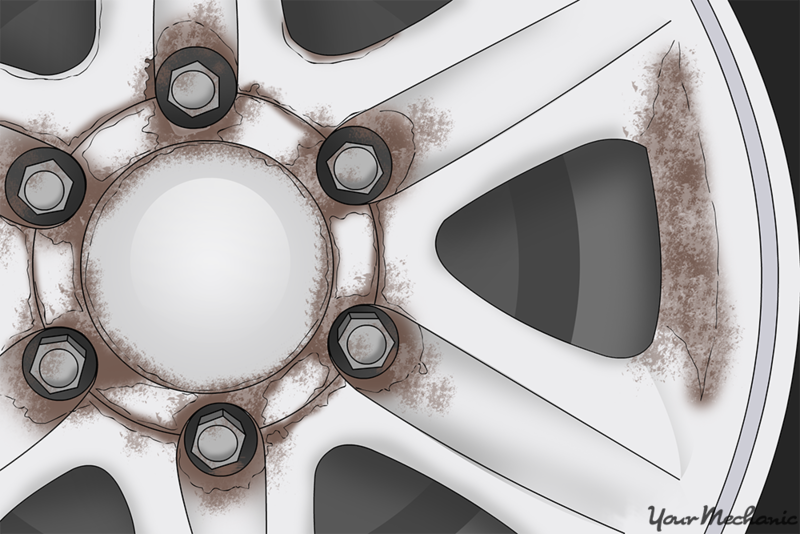 Brake dust is residue that accumulates on a car’s wheels over time. The dust comes from the brake pads, which wear down over time from the friction of braking. The pads slowly wear down, and the worn off material becomes airborne dust that settles on the wheels over time. Brake dust is similar to soot, and can be tricky to remove from lighter-colored finishes. One of the most common finishes found on wheels, unpainted aluminum, is particularly good at highlighting brake dust. However, there are some tried and true methods that will remove this residue quickly and easily. 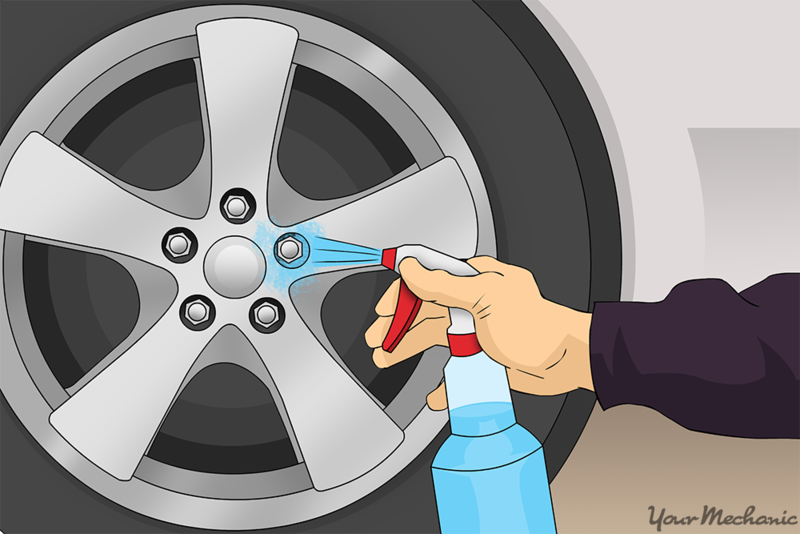 Step 1: Prepare to clean your car’s wheels. Before getting into the messy part of cleaning brake dust off of your wheels, make sure you have a good location to work in and ensure that you have all necessary tools for cleaning the wheels. Ensure that you wear some form of eye protection. Soap and water only stings if it gets in your eyes, but the oily runoff from the brake dust would be more problematic if it splashed back at you while washing your car. A good spot will allow you to regularly wash away the dust once it has been scrubbed from the wheel. Make sure you can reach all four of the wheels with the hose. Tip: Make sure the wheels are cool before continuing with the process. 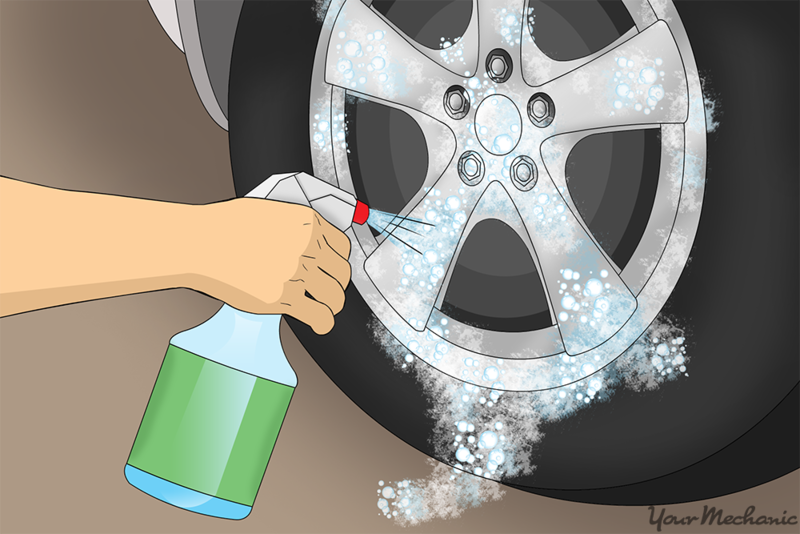 If you have driven your car recently, wait 10-15 minutes before cleaning the wheels. Step 2: Remove all hubcaps. Most aluminum wheels are made of one piece, but some still use hubcaps. 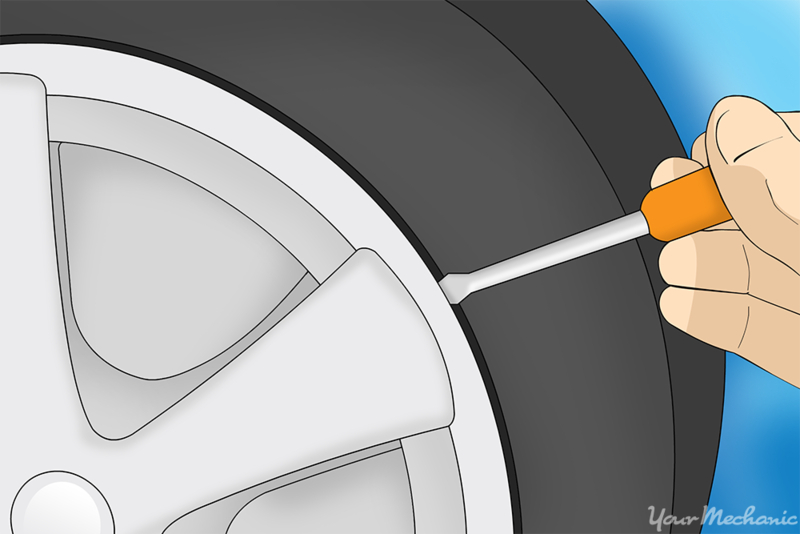 If your wheels have hubcaps on them, use a flathead screwdriver to remove all four before continuing. Put the hubcaps down on a tarp or towel next to the car and wash them the same way that you wash the wheels on the car. Warning: Never lay your hubcaps on the pavement with painted side down or they will get damaged. Step 3: Brush the wheels. Take the hose and spray water all over and around the wheels. Go over every wheel with the brush to remove any dirt and grime accumulated on the surface. Brush the wheels very lightly for this step to just remove excess dirt and road debris. After the wheels have soap on them, you can really scrub them to get grime and brake dust off. Step 4: Make a soapy solution. Mix up a teaspoon of soap in a bucket half-full of water or follow the recommended dilutions given on the package of soap. Put the sponge in the soapy water and stir it around with the brush. Apply the soap to the wheels once it forms bubbles or foam. Tip: Apply soap to the wheels with the sponge, but use the brush to add soap to any hard-to-reach places or smaller openings. Put soap on all four wheels so it has time to sit on the wheels and break up some of the grime, before you scrub the wheels clean. Do not allow the soap to dry before scrubbing and rinsing it. Step 5: Scrub the wheels. 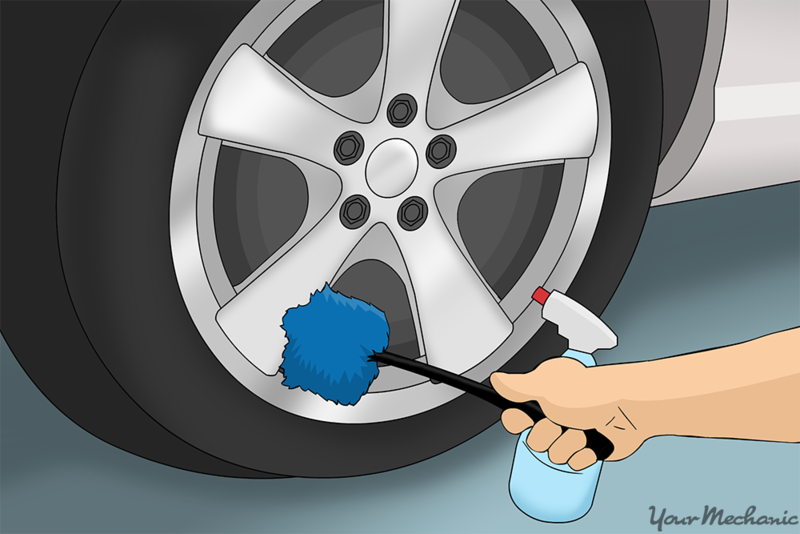 Once the wheels are sufficiently soapy, scrub the entire surface of all the wheels with the brush. Use the sponge to wipe the wheel down and focus on getting the sponge into narrow openings and spaces to wipe away any dirt that was loosened by brushing. Tip: Most of the brake dust accumulates on the inside of the rim so ensure that you work on this area as well. You may need to go over problem areas several times until they match the rest of the wheel. If any dark spots are really persistent, apply more soap and then move onto the next wheel. You can circle back and scrub the problem spots once all of the wheels are mostly clean. Tip: Routinely rinse the brush off in the bucket of soapy water to keep it clean, and scrub until the entire surface of the wheel is the same color and finish. Step 6: Rinse the wheels. Once the wheels are sufficiently clean, thoroughly rinse them with water from the hose. Rinse them for longer than you would normally, as the dark, greasy runoff from cleaning off brake dust tends to get everywhere around the wheel. Using specialized chemicals to remove brake dust from aluminum wheels is another viable option. If you own more expensive wheels, this method is best as there is less abrasive scrubbing involved. Use the following process to remove brake dust after cleaning your wheels with a basic soapy solution. Tip: Ensure that you use mouth and skin protection as well as eye protection as mentioned on the cleaning chemicals label. Step 1: Test the cleaner. Try to choose a cleaner that is specifically used to clean brake dust off of aluminum. Most cleaners come in the form of a spray bottle or a pressurized can and are applied either as a liquid or as a foam. Tip: Test the cleaner on a small spot of the wheel that isn’t too visible. If the cleaner stains or otherwise harms the test spot, then this prevents you from ruining a whole set of wheels before finding out. Step 2: Apply the cleaner. Apply the cleaner to the wheels as directed. Most require that a moderate amount be sprayed onto the wheels, with extra focus on the problem areas, and then left to sit. Note: Do not allow the solution to sit on rims longer than recommended or allow it to dry on the surface. 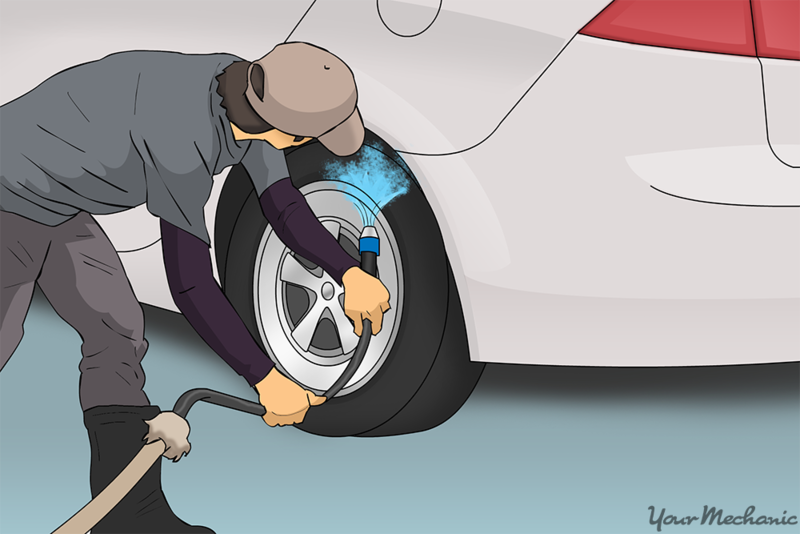 Step 3: Scrub the wheel. Take the brush and scrub the wheel until all of the grime and brake dust is loosened. If scrubbing is not effective in removing the dust on one wheel, then spray more cleaner onto the wheel and move onto the next. By the time you circle back around, the cleaner will have removed more of the brake dust. Step 4: Rinse the wheels. Rinse the wheels off thoroughly to remove any trace of brake dust or wheel cleaner. Step 1: Apply wax. Once the wheels are clean, you can apply wax to protect the finish of the wheels. Apply wax, usually in the form of a paste, with a cloth to the surface of the wheel. 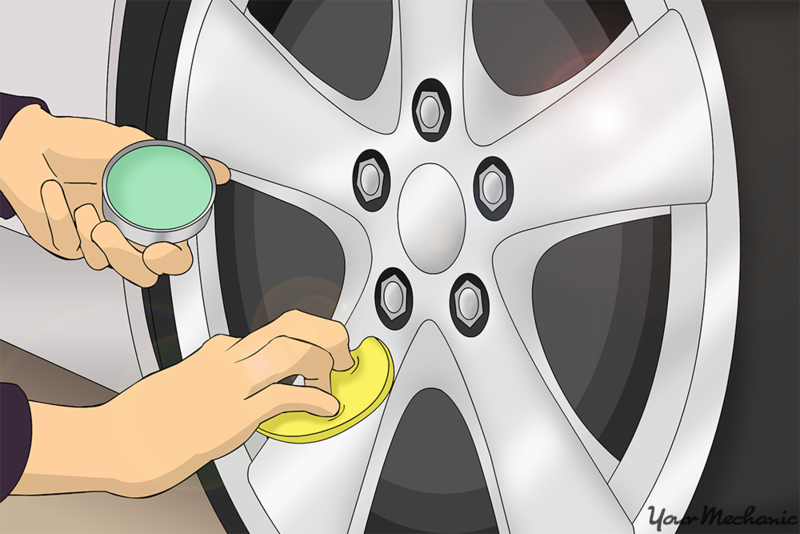 Rub the wax onto the wheel until there is no visible residue left behind. Repeat this process for all four wheels and hubcaps. Warning: Do not get any wax on any brake surfaces to avoid reducing their proper functioning. Step 2: Put back the hubcaps. If you have hubcaps, place them back onto the wheels. Note: Make sure they are firmly secured before driving anywhere. It is essential to ensure that you remove brake dust from wheels whenever you wash your vehicle. Excessive brake dust deposits are harmful to the performance of wheel itself. If this dust is left on the wheel, the corrosive nature of the brake dust actually corrodes the clear coat over time. This corrosion eventually eats into the wheel surface leaving large pits that cannot be fixed easily. If you notice that the brake pads are wearing out quickly, get a certified mechanic, such as one from YourMechanic, to inspect them and replace the brake pads if necessary. Q: Should I change my rotors?